* Make sure your project and work area is dust free. * Use and store 3-D Crystal Lacquer at room temperature. * DO NOT SHAKE 3-D Crystal Lacquer. It will create air bubbles. * Have extra tissue and cotton swabs handy for corrections. * Paint brush (optional) can be used for background. * Normal drying time is 15 to 30 minutes. Larger areas and thicker application will take longer to dry. 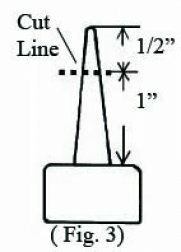 knife as indicated on Fig.3. While you are using the 3D Crystal Lacquer, always let it rest tip-side down in a container where you put damp towel on the bottom. 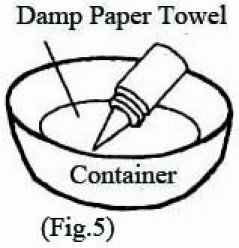 This will prevent the tip from getting clogged up with dried product. After use, rinse the Tip thoroughly with water. To make sure all product has been removed from the inside, blow on the plastic part. 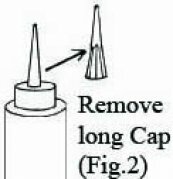 If the air does not go through well, use the cleaning pin to scrape excess Lacquer from inside the Tip. 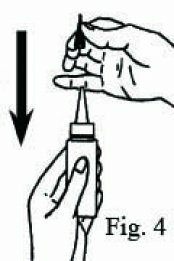 Dip Applicator Tip in the Nail Polish Remover for a hour or two. Dried 3D Crystal Lacquer will be whiten and loosen. 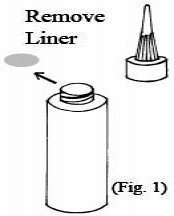 Use cleaning pin to remove all 3D Crystal Lacquer from Matal tube on the Applicator Tip.